He gathered the animals two by two and survived a great deluge. Ages later, his name has become one of the most popular for boys born in the US. 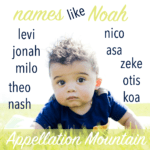 Top Ten Week continues with Noah as our Baby Name of the Day. No matter how limited your knowledge of Christianity, you almost certainly know the story of Noah. Stories about devastating floods are common to many cultures. This one unfolds in the Book of Genesis, and involves an angry God and a faithful servant. Noah builds his ark according to divine instruction. He and his descendants survive, and God promises to never destroy the earth again. Cue the rainbow. Most agree that Noah comes from the Hebrew noach – comfort. The name was one of many adopted during the Protestant Reformation, and you can still find notables in Colonial America. Founding Father Noah Webster is among the most notable. He’s the source of Webster’s Dictionary, and once published all manner of secular educational texts – something of an innovation in the new nation. By the nineteenth century, Noah remained in the US Top 200, but not for long. He dropped over the next few decades, cratering in the 600s, before reversing his decline in the 1970s. By 1981, Noah had returned to the US Top 200. He broke into the Top 100 in 1995, the Top Ten in 2009, and ranked #4 in 2012. In 2013, he claimed the #1 spot, displacing Jacob. Some of his popularity was tied to our general interest in Biblical names for boys and our growing willingness to see ends-with-a names as masculine. If Joshua was stylish, why not Noah? In Steinbeck’s Grapes of Wrath, one of the Joad family members answers to this name. 1960s spy TV series It Takes a Thief used the name for a character, possibly helping to jumpstart his return. Noah Cross was the bad guy in 1974 Roman Polanski-Jack Nicholson classic Chinatown. Veteran actor-director John Huston played the role. Alex Haley’s Roots became a huge sensation with the 1977 miniseries. Lawrence Hilton-Jacobs played a character called Noah. ER was a huge hit in the 90s, and Noah Wyle probably helped popularize his given name – and the name of his character, Carter. But the strongest association remains the Biblical patriarch. In 2014, a Hollywood epic cast Russell Crowe as the ark-building man of faith, but it gave him a darker, more nuanced story than the simple two-by-two songs we learned in Sunday school. Another production appears to be underway at the BBC, with David Threlfall starring. Perhaps one of the most remarkable stories relates not to an ancient flood, but a recent one: Hurricane Katrina. Parents Glenn and Rebekah Markham relied on reproductive technology to conceive their first child. Several frozen embryos remained, and were in danger after New Orleans flooded. Fertility clinic doctors rescued the embryos, and one of those became Glenn and Rebekah’s second son, a little boy named – what else? – Noah. A handful of girls have been given the name, too, including Miley Cyrus‘ little sister, who has an acting career of her own. Still, there’s no real danger of name theft – over 17,000 boys received the name in 2012, compared to 77 girls. Plus, Noa is a feminine name in the Old Testament, with separate roots. Overall, it is easy to see the appeal of this name – he’s a hopeful choice, a serious choice, and an upbeat, modern, appealing one, too. There’s no question why Noah ended up a Top Ten name. I obviously knew the story of Noah from the Bible, but I first considered it for a boy name when I watched “The Notebook.” I loved the main character’s name: Noah Calhoun. My first born son’s name is Noah and he was born in 2009. I obviously love the name and still do.